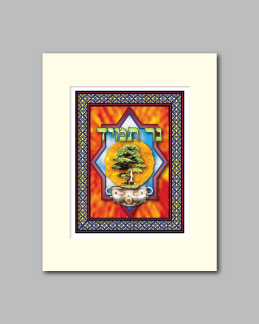 Jewish Symbols :: "Tree of Eternal Light"
The inspiration for “Tree of Eternal Light” comes from the merging of two symbolic Jewish motifs ~ The Burning Bush, and The Eternal Light or “Ner Tamid” (נר תמיד). In the Old Testament book of Exodus, Moses, while tending his flock of sheep, discovers the “burning bush”, a bush that is engulfed in flames, but does not burn. It is the first time he experiences our Creator’s omnipotent power. The “Ner Tamid” or Eternal Light, found in all synagogues, stands as a beacon to remind of G-d’s enduring presence in our lives. 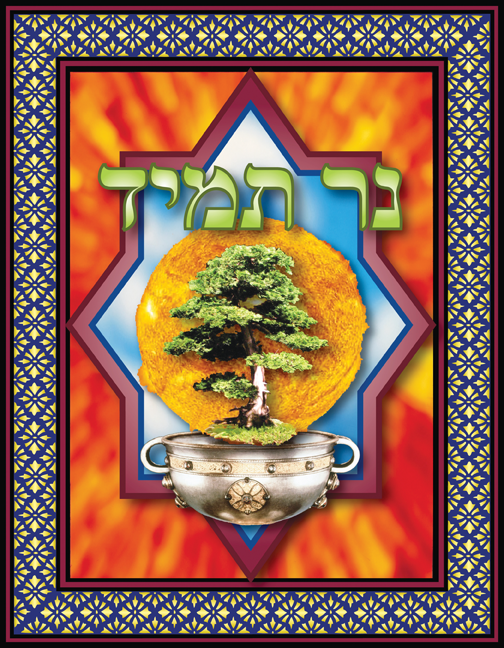 The background of this piece depicts the miraculous fire that did not consume the symbolic bush in the story of Moses. 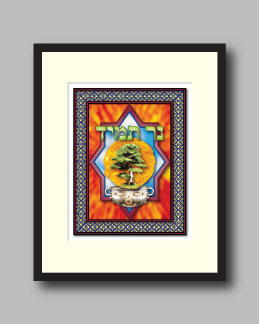 In the center, a magnificent tree, or Tree of Life stands as a symbol of Torah that sustains our lives as Jews. The tree is suspended above a regal cup reminding us of the divine hands that will catch us if we fall. An open clear blue sky stands as a symbol of the realm of heaven.